Adapted from the chair Thomas Jefferson used while composing the Declaration of Independence Revolving Windsor Chair A few years ago it fell to me to write a story about Thomas Jefferson in a chess match with his slave Jupiter. This venture led to a play on the same subject, as well as research into the physical objects used as metaphorical vehicles for the ideas. In this regard, Jefferson makes it easy for us. One of the more obvious physical items is the revolving Windsor chair used by Jefferson when he was working to draft the Declaration of Independence in 1776. Having seen a picture of the chair in its surviving form and another picture of a re-creation of it, I undertook to make a similar one to use on stage. My version differs from the original in the use of a steam-bent arm rail rather than a sawn and carved one, because I could make a bent arm faster than a sawn one. Making this swivel Windsor is in some ways easier than making a normal one, in that the seat is circular rather than a sculpted outline. There are a lot of parts and processes to a Windsor chair, but with the exception of hollowing the seat, you have already seen how to do them all. Windsor chairs, as the name suggests, are of English design. 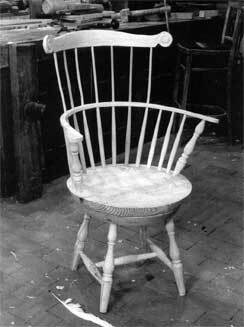 Windsor chair-making in England centered around the town of High Wycombe, but the chairmaking did not begin in town. Out in the woods, workers called chair bodgers felled, split, and turned the beech legs on their springpole lathes, then sold these legs to chairmakers in town. There, craftsmen would join the legs and spindles to the carved seat planks to make completed chairs. "The Woodwright's Apprentice: 20 Twenty Favorite Projects from the Wodwright's "